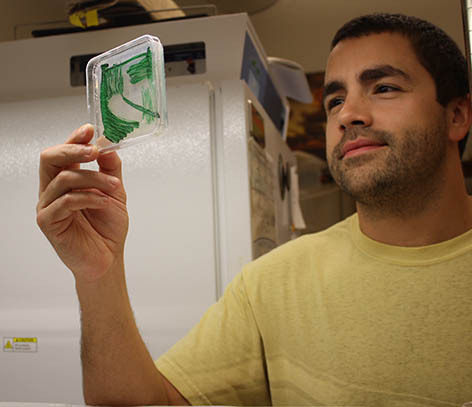 This month, Randy Lacey (Binder Lab) published a paper in the journal Plant Physiology entitled Ethylene Regulates the Physiology of the Cyanobacterium Synechocystis sp. PCC 6803 via an Ethylene Receptor (Plant Physiology 171: 2798-2809). Ethylene has long been known to function as a hormone in plants. In this research Randy demonstrates that ethylene receptors are also found in the cyanobacterium, Synechocystis and ethylene regulates various aspects of Synechocystis physiology. This is the first demonstration of a functional ethylene receptor in a non-plant species and suggests that ethylene perception is more widespread than previously believed.This article was featured in the journal with a commentary.